You can download a bunch of new converted .NET importers in order to beta test them. They all contain the new “import into existing dives” feature and are the ones that will be included in Diving Log 5.0. The converted importers are: Uwatec DataTrak, SmartTrak, Mares IRIS/DRAK, DCDS 2000, Suunto DM 2.x/3.x, Oceanlog 1.x/2.x and PC LogBook. Update: These importers are now also included: Delta P ProDive/ProLink, ReefNet Sensus Manager and Citizen Aqualand. The new importers are available in the vertical menu on the left side. In the main menu bar (menu File > Import) are still the old importers available in the case you have problems with the new ones. Please report any bugs or problems. The imported dive data should match with the data from the old importers, so you should not see any difference. Rainer Mohr from divelogs created an API plugin for Diving Log which enables direct uploading dives from Diving Log to divelogs. Up to now you had to export your dives first to UDCF and then upload the file in the divelogs web interface. But due to the UDCF format not all possible logbook data could be uploaded. The new direct upload is much more easy and quicker. Please click here to download the new upload tool. 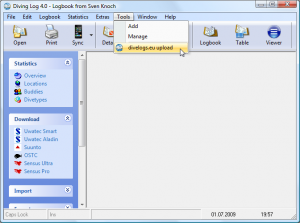 Extract this zip file into the Diving Log program folder. To start the upload you must either click the “Exporter.exe” file (or create a shortcut on your desktop) or you can add the Exporter.exe into the Tools menu of Diving Log. 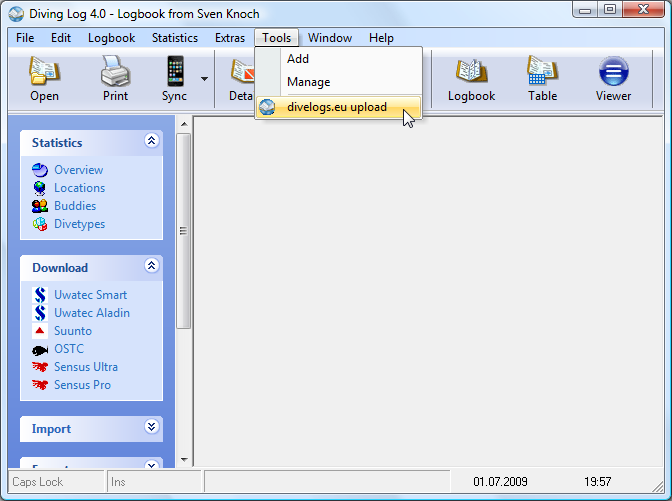 With the next Diving Log update the upload will be integrated into Diving Log. UPDATE July 6th: I’ve updated the uploader today to support multi user scenarios and fixed one possible bug. Simply uncheck the “Save Login Information” checkbox to get a login dialog each time.